You can borrow these great titles from Leeds Libraries. The sales figures for UK children’s books tell us that they have hit an all-time high in revenue and market share in 2014, and exceeded sales of Adult Fiction for the first time since accurate records began. Print sales came to £336.5m for the 52 weeks to 27th December 2014, a 9.1% rise year on year, and exceeding the previous high – 2009’s £329.7m. For the first time since records began in 1998, nearly £1 in every £4 spent on print books (24%) was on a children’s title; the previous high in market share was 2013’s 21.7%. Children’s sales overtook Adult Fiction for the first time. Adult Fiction went down by 5.3% to £321.3m and it’s the fifth straight year the print fiction market has declined. Since 2010, the overall print market has declined 18.9% or £324m. In that time Adult Fiction has dropped by 29% (-154.9m) while Children’s has increased by 3.2% (+£10.7m). 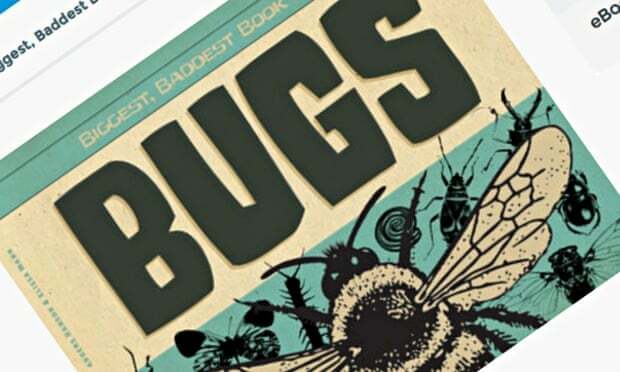 A school girl in California has told a publisher that it isn’t only boys who are interested in insects. The publisher responded and told her she had made “a very good point”. “After all, girls can like ‘boy’ things too,” wrote Abdo, adding that it had “decided to take your advice”. Parker has since received an early delivery of the series, which is now called simply Biggest, Baddest Books. We did a recent post about book publisher Penguin’s hotline – The Penguin Hotline – to help Christmas shoppers select the right book for anyone on their Christmas lists. Another source of book advice and reading online is The Bookbug Detective from The Scottish Booktrust. They will help you with any questions you have about books and reading for your little one. If you’d like some book recommendations or advice send the Bookbug Detective an email. They also have some good book lists, say to help with the loss of a pet. Sir Quentin Blake’s new book (published September) The Five of Us celebrates young people with disabilities. Most well known for his illustrations of the Roald Dahl books, this story is aimed at children aged five to seven and is about five friends, “each of whom has an unusual ability”, who save the day after disaster strikes on a day out in the countryside. The new Booktrust Best Book Awards winners announced in July were chosen by 12,000 children nationwide and this year, in some categories, books that deal with real challenges facing young people have proved popular. • 0-5 BEST PICTURE BOOK – Peck Peck Peck by Lucy Cousins, the creator of Maisy – which sold more than 28 million copies around the world and has its own popular TV show. • 6-8 BEST STORY – Timmy Failure: Mistakes Were Made by Stephan Pastis. • 9-11 BEST FACT – Operation Ouch! : Your Brilliant Body by Doctor Chris and Xand van Tulleken.